A movie about those who appreciate the finest things in life ... for free! Audrey Hepburn was never more sleek and glamorous than in this delightful romantic caper costarring Peter O'Toole and directed by William Wyler. She's the chic daughter of a renowned art collector and covert forger (Hugh Griffin) who's deposited his best work, a famous statue, in a Paris museum. Trouble is, technology can now detect such forgery, so Hepburn plots to steal the statue with the help of O'Toole, an amateur thief and covert inspector. Of course, neither of them knows the whole truth about the other. Quick - who’s received the most Oscar nominations for Best Director? Steven Spielberg? Nope - Senor Spielbergo is stuck at five nods to date. David Lean? Good guess, but he never passed seven selections. Billy Wilder? He lands in second place with eight Best Director nominations. To my surprise, William Wyler takes the prize for most Best Director nominations, and by a wide margin. As I mentioned, Wilder comes in second place with eight nods. Wyler, on the other hand, took in an amazing 12 Best Director nominations over his career! He won three of these for Ben-Hur, The Best Years of Our Lives, and Mrs. Miniver. Wyler didn’t get one of those 12 nominations for 1966’s How to Steal a Million, one of his final films. And for good reason. Million offers some fun but it’s an extremely lightweight effort. Set in Paris, Million starts at an art auction, where a Cezanne painting sells for $515,000. We learn this came from the collection of Charles Bonnet (Hugh Griffith), a local art maven. What the others don’t know is that Bonnet forges his art, so the Cezanne is a fake. 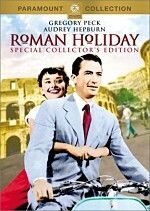 His daughter Nicole (Audrey Hepburn) tries to discourage Bonnet from selling these forgeries, but he can’t help himself. Matters intensify when Bonnet decides to loan a phony Cellini statue - faked by his father - to the local museum. This really freaks out Nicole, since she worries the public display will give away the family game. In addition, we see that American collector Davis Leland (Eli Wallach) badly wants to own the Cellini for himself. After Bonnet donates the statue and goes to a party, someone breaks into the home while Nicole is alone. 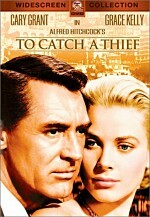 She confronts the would-be burglar, handsome Simon Dermott (Peter O’Toole). She accidentally shoots him in the arm and then cares for him grudgingly, a matter that includes driving him back to his hotel. Nicole chooses not to press charges because she worries about more investigations into the family forgeries. The bold Dermott also wins over Nicole when he kisses her and gains her affection. Although he pretends to be a thief, we soon learn the truth: Simon’s actually investigating suspected fraud on the part of Bonnet. Of course, he doesn’t reveal that to her. In the meantime, Leland asks out Nicole, mainly to get closer to owning the Cellini. He tries to woo her but admits his deception. Since she worries that he’s investigating them for forgery, this relieves her, and the two impulsively agree to marry even though she’s clearly interested in Simon. Matters connected to the Cellini complicate further when the museum plans to conduct a technical examination to evaluate its authenticity. To keep the secret, Nicole recruits Simon to steal the Venus. Much of the rest of the movie follows their caper and its repercussions. Million is the sort of flick that’s so light I find myself amazed the photography stuck to the film. As I noted at the start, director Wyler comes with a terrific pedigree, but that doesn’t mean that everything he does needs to be weighty and epic. Wyler engages in fluff well through this flimsy but mostly entertaining flick. Probably the movie’s biggest problem relates to its length. Million drags past the two-hour mark, which seems way too long for a flick of this sort. It’d fare better around 90 minutes, I think, and it easily could have lost the entire Leland subplot. I don’t think those elements add anything to the story, and Wyler could have excised them with no negative effects. Despite some slow-moving moments, Million usually comes across as fun and charming. Clearly, the cast helps. Hepburn and O’Toole demonstrate nice chemistry and interact well. They can’t add much substance to their thin parts, but they give us good eye candy along with amusing energy. I must admit Million reminds me an awful lot of another Hepburn vehicle, 1963’s Charade. They feature similar tones, with light looks at crime. 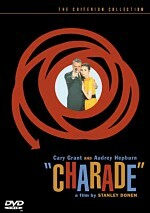 Charade is a substantially stronger film, but at least O’Toole seems like a better match for Hepburn than Grant, at least due to the age thing. The movie’s best moments combine the chemistry of the leads with the intricacies of the caper. Those focus heavily on the two main actors and also offer some very clever solutions to problems. No real tension occurs since we know things will work out for the characters, but the movie engages in the different situations nicely. No one will mistake Million for a rich, substantial experience, but it entertains. How to Steal a Million appears in an aspect ratio of approximately 2.35:1 on this single-sided, double-layered DVD; the image has been enhanced for 16X9 televisions. The movie mostly looked very good. Sharpness appeared positive. The image seemed distinct and detailed. Occasional wide shots were slightly iffy, but the movie almost always appeared tight. No issues related to jagged edges or moiré effects popped up, and only a smidgen of mild edge enhancement appeared. Print flaws appeared largely absent during this mostly clean and smooth presentation. The occasional speck cropped up, but very few of these defects manifested themselves throughout the flick. Million featured a natural palette that seemed well presented here. The colors came across as wonderfully vivid and lively throughout the movie, and I thought they looked quite solid most of the time. Black levels also appeared deep and rich, while shadows were nicely detailed and concise. Overall, the picture seemed very solid and fared quite well given its age. I flip-flopped between an “A-“ and a “B+” but went with the higher grade just because so much of the presentation impressed me. 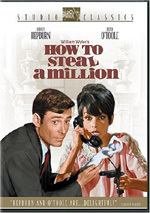 The stereo soundtrack of How to Steal a Million seemed acceptable but not any better than that. Across the board, it felt like broad monaural. Music demonstrated light stereo imaging and that was about it. Some minor effects usage cropped up on the sides, but this remained a restrained track, so not much occurred. The mix made the dialogue less well centered than I’d like, as the speech spread across the front and lacked great localization. Audio quality seemed average. The dialogue was decent but tended to be loose due to excessive reverberation. Music also came across as bland, as the score lacked much clarity. It presented decent low-end in general but still remained rather drab. Effects played a small role in this chatty flick, but they didn’t prosper either. Those elements were bland and without definition. Happily, the DVD also included the film’s original monaural soundtrack. This mix didn’t excel, but it avoided some of the problems found on the stereo version. Speech still showed a little edginess, but the lines came across as more direct and intelligible. Music and effects were also a bit better defined and rounded. The difference between the two wasn’t enormous, and the mono track still only merited a “B-”. Nonetheless, that bettered the “C“ I gave to the stereo version. As with all Fox Studio Classics releases, How to Steal a Million offers a few supplements. We start with an audio commentary from actor Eli Wallach and Catherine Wyler, daughter of director William Wyler. Both sit separately and the results get edited together. Don’t expect much from this spotty track. Wyler dominates to a degree, as she talks about her father. She tells us a little about his career in general, his relationship with Hepburn, and the way his work impacted his family. Wyler occasionally presents some nice notes, but we don’t learn a ton about her dad. Wallach pops up more sporadically. He tells us how he got the role and what it was like to work with the others. He also adds some general comments about his career and acting. Really, the information provided is decent. Nothing exceptional appears, but I think the remarks add some flavor. Unfortunately, an awful lot of dead air occurs. Combine that with the lackluster nature of the material and this turns into a pedestrian commentary. Next we find an A&E “Biography” episode entitled Audrey Hepburn: The Fairest Lady. In this 44-minute and 58-second piece, we see movie snippets from some Hepburn efforts plus archival materials and interviews. The latter include biographer Barry Paris, actors Richard Dreyfuss, Harry Belafonte, Robert Wolders, and Roddy McDowall, director Blake Edwards, friend Connie Wald, and son Sean Ferrer. As one might expect from a show in the Biography series, Lady” emphasizes general elements of Faye’s life. It covers her childhood experiences - including problems connected to World War II - and moves through her career and personal life. Most of these “Biography” shows concentrate on the latter, and they occasionally come across like tabloid TV. That doesn’t happen here, as Hepburn’s life doesn’t offer much fodder for controversy. Her parents fought and divorced during her childhood, and her dad was a Nazi sympathizer. She also suffered some miscarriages and some marital problems. We do hear a fair amount about her romantic life, though without the tabloid slant. We also get a nice look at her humanitarian efforts. It’s not a scintillating episode, but “Lady” gives us a good view of Hepburn’s life and career. Finally, a few ads show up here. We get two trailers for Million as well as two TV spots. Unlike most flicks in this series, however, we find no promos for other Fox Studio Classics DVDs. There’s not much depth to How to Steal a Million, and it suffers from some plodding moments. However, the movie enjoys a good cast and likable energy that makes it mainly a fun and amusing romantic comedy. The DVD presents very good visuals with somewhat weak audio and some erratic but decent extras. Million comes with a low list price that makes it enticing for fans. It’s worth a look.